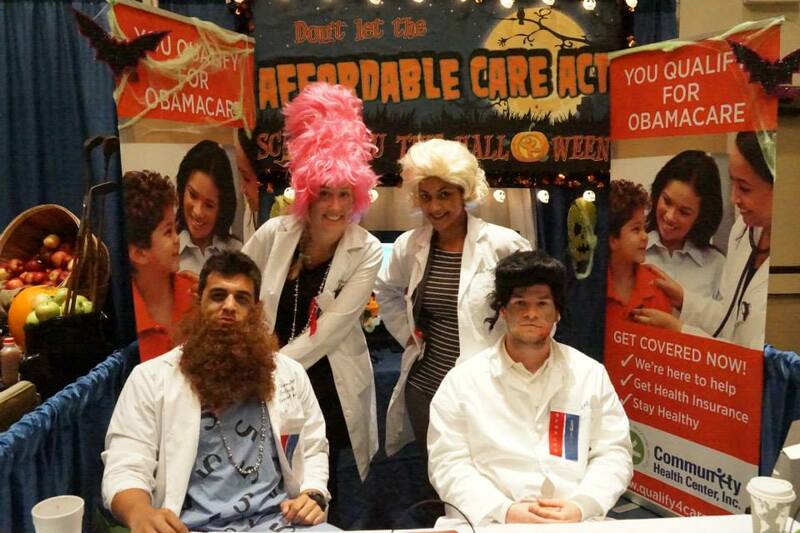 Don’t Let the Affordable Care Act Scare You This Halloween! CHC staff & AmeriCorps sitting at the Expo booth in full costume! Aside from our spooky and fun decorations, we had an ACA-centric PowerPoint displaying photos from recent enrollment fairs and outreach events along with basic facts about the new law. We also had plenty of CHC handouts and brochures filled with information for people to take as they please. Another large component of the business expo booth is the wardrobe choice for staff. Although a business expo can be determined a formal event, we like to take that extra step and coordinate outfits that fit our booth’s theme. Seeing that we are a health center, promoting a Halloween theme, the choice of dressing up as “Zombie Doctors” was a fun way to get people excited about a somewhat sensitive topic. All in all, it was a great experience speaking with a variety of people about OBAMAcare. We received positive responses to our festive booth, crazy wigs & zombie makeup along with sincere appreciation for promoting the new law. I also would like to add a special THANK YOU to Walter Squier, a member of CHC’s facilities team. Every year, Walter goes above and beyond to make sure the Expo setup and operation runs smoothly. Without Walt and his hard work and dedication, we would never be able to have such a wonderful setup. Who are you, Shannon Bali?